Using a Lenovo IMEI Check tool before you SIM Unlock your cell phone or purchase a used Lenovo smartphone, is the best move you can do. Lenovo Group Ltd. is a Chinese multinational technology company, founded in 1984 in Beijing. Despite being the world’s largest personal computer vendor from 2013 to 2015, Lenovo entered the smartphone market in 2012 and since 2014 they bought Motorola Mobility and became the second cell phone manufacturer in China. Lenovo is not so popular in the USA but Europe and Asia respect Lenovo mobiles because they are quality products with a durable battery in way cheaper prices than Samsung, Sony or HTC. They buy second-hand Lenovo phones from online markets, local retailers or through a personal transaction which are SIM Locked, Blacklisted, Google Smart Locked or clones. You will never be one of them with a full Lenovo IMEI Check. When you order a Full IMEI Check report, all the data below are instantly sent to your email. Shows if your Lenovo Android phone is really simlocked, by which Carrier and in what country. Under contract/Under Warranty Lenovo phones can become blacklisted or relocked at any time. Shows if the IMEI or the Serial Number were changed. Any illegal alteration will flag the Lenovo cellphone as replaced and it will become blacklisted. Original IMEI, original Serial, model, color, capacity, etc. What is so special about IMEI info? Every Lenovo phone has a unique IMEI which is a special 14-17 digit code. Lenovo and Cellular Networks store IMEIs inside GSMA servers in order to verify their originality and functionality with the info you saw above. How a Lenovo IMEI Check provider gets you the IMEI info? 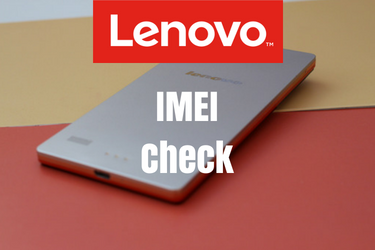 Only official IMEI Check companies can enter GSM IMEI databases and track down the Lenovo you want to investigate, using only the Lenovo’s IMEI number. To find the IMEI number of your smartphone, just tap on the phone icon, and on the numeric keypad type *#06# as shown. You can also find the IMEI number inside the settings menu. Enter settings, then tap “All settings”, swipe to the bottom, tap “About phone”, tap “Status”, then tap “IMEI information”. To check the model number of your smartphone, go to settings. Tap “All settings”, swipe to the bottom, tap “About phone”, then tap “Version infos”. Keep in mind that trusted used Lenovo Retailers use this service as a certification to ensure that the refurbished cell phones they are selling are completely OK.
On top of that, it will be impossible to SIM unlock a Lenovo smartphone with an IMEI Unlock Service or through the Network without an IMEI Checker. If it happened to see a Free Lenovo IMEI Check Service you should avoid it at all cost because none of them have real GSMA DB access but they use private and outdated IMEI data-banks. I highly suggest using UnlockSpector for Lenovo IMEI Check Services. We tested them (and more than 30 other IMEI Checkers) and the results where flawless. Leave a comment below if you still have questions about Lenovo IMEI Checking. Until next time, take care! Thank you guys for this awesome post about Lenovo IMEI Check. I didn’t know anything about IMEI Checking and you saved me from a lot of trouble because I was going to buy a blacklisted Lenovo Z2 plus. Cheers! They tried to sell me a SIM locked Lenovo A Plus, I read this article about Lenovo IMEI Check and of course, I didn’t buy it. THANK YOU! Pleasure is all ours. This is why you will never get scammed again when you use a Lenovo IMEI Checker.